Pacifico goes back into open sea. 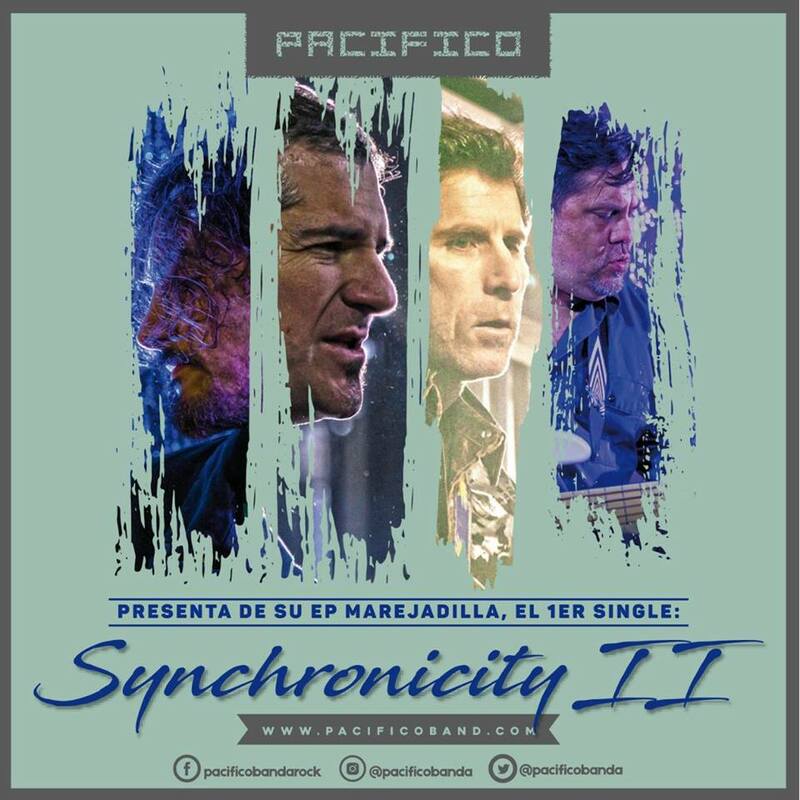 It does so with a solid EP, from which the first single, “Synchronitiy II”, a cover of 1981 the song by The Police, stands out. Pacifico takes this underrated classic and makes it its own. On one hand, this rendition evolves from a carbon copy of the original in terms of execution and progressively updates it with the sound and expressiveness of the band. On the other, Sting's original lyrics, which portray the post-industrial life in 70s London take a new life in Pacifico's Spanish version, surprising us with its relevance and undeniable truth about the subject of weariness and desire to escape into new waters. “Marejadilla” contains 4 songs recorded by the now usual contributor, renowned Sound Engineer and dearest friend, Gerónimo Labrada. Recorded in “Cote Foncea”, this is an independent edition that consolidates the labor that Pacifico began with their first LP, where the original trio formed by Carlos Sáez on vocals, Felipe Galaz on Bass, and Daniel Martin on Drums, is decisively joined by Ricardo Rozas on Guitars. The passage of time leaves behind the suspicious sensation that the ways to feel and convey emotion in music are fading away. Even worse. that everything converges and turns into the same thing. The band, in rebellion, decided that their creative focus would have one foot placed on honest emotion and the other rejecting trends, niches and tags that label everything. The relevant thing for Pacifico is its identity and the total conviction that we create a genuine artistic product that flows from the soul. In our case, it remains linked to the prepubescent kid that discovered in music his purpose in life. Carlos Saez and Felipe Galaz, band composers, merge from musical projects that seem dificult to combine. Saez is the voice of Pacífico, as well as guitar and keyboard player. Seminal, Chilean prog band, with an LP produced in 2015, is where Saez grew as a musician. Galaz, bassist and the band's creative producer, migrates from Late Harvest, where he produced an LP in 2016 - together, they shpaed Pacifico. The band is completed by Ricardo Rozas on Lead Guitars and by notable visual artist Daniel Martin (@yayozoide; 1000 días corrosivos on Instragram) who, on his drumset, is the key to the band's fresh and powerful sound. Mixed and Post Produced by the renowned Cuban Sound Engineer based on Chile, Gerónimo Labrada, his contribution is critical in the crystallization of Pacifico's first LP, and in everybody's plans, as a second LP is already looming on the horizon, thanks to the prolific activeness of Saez's and Galaz's creative duo. The band is looking forward for future presentations and we dream of places beyond Chile's borders, where we'll assuredly find eager audiences that will enjoy a new proposition, as they always do.